"Just to let you know everything is working and to say a big 'thank you'. This was excellent customer service and very much appreciated - other companies could learn from your friendly and efficient approach!" Celebrating 10 years since its launch, Repeat Signage has developed, adding many new features, and is in daily use across multiple applications and vertical markets with customers in over 30 countries across the world. For example, our Irish reseller, supplies and installs large format display screens, interactive screens and video walls across Ireland, specifically into the hotel, retail and corporate sectors. By offering Repeat Signage digital signage software as part of their portfolio, they can give their customers a digital signage solution for them to promote their own products, brand or services on display screens. "Due to Repeat Signage software's easy user interface, staff required very little training and found that their current Microsoft Office skills were transferable to Repeat Signage." David Marsden, ICT Network Manager Westholme School, Lancashire. There is no stock to hold and no targets to meet. Repeat Signage software is downloadable onto a Windows PC, and licence keys are emailed to you for your customers. A free trial download is available which allows your customers to try the software for themselves and will play for 10 minutes before a 'trial version' message appears. We provide free online training videos, although Repeat Signage is so easy to use, you can create a presentation and have it playing in minutes. An online help menu is available 24/7 and is accessible via the F1 key within the software. We give you free technical support via email (Monday to Friday 08.00-22.00UK time with limited support over weekends and bank holidays). You and your customers can set up a free account on our online server for remote updating of presentations, with access to a free RSS news creator and 3,000 images. The RepeatServer is accessible from within the software. We add your company details to our reseller page linking to your website and helping to promote your business through success stories and social media. Please email us: resellers@repeatsoftware.com and include details of your company and a link to your website. "Repeat Signage software is Windows based so it's very easy to navigate and use. It's packed with features which you would only expect to find in bespoke systems. It represents very good value and gives terrific return on investment. Initially I was not particularly interested in reviewing or promoting another Digital Signage system as we had reviewed a large number and felt the systems we were supplying to clients met all their needs. However, once I met with their support team during ISE in Amsterdam, I realised this software system is perfect for clients who want an easy to use system with all the features but not the big price tag. The back up and support from the team at Repeat Software is second to none and I have no hesitation in recommending Repeat Signage". Odilon Hunt, AVA Systems (Ireland reseller partner specialising in supplying display screens to hotels and retail across Ireland. Even with the simplicity of Repeat Signage digital signage software, designing effective presentations is an art and not every customer has design skills nor the time to produce them. You can generate extra revenue by designing presentations for clients, supplying and/or installing hardware, and also giving training on the updating of presentations once created. Ideal for graphic design companies to offer digital graphic designs for display screens. 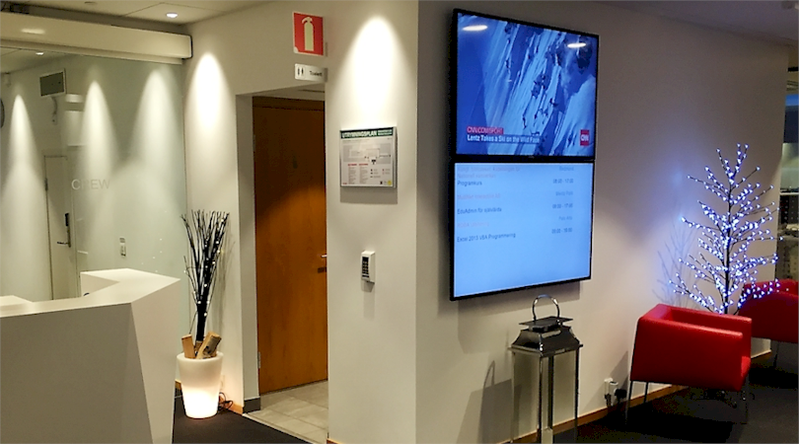 Swedish company MultiNet supply Repeat Signage digital signage software to their clients across Sweden. Touch screen support has been added to Repeat Signage so there is also the opportunity of setting up information kiosks or touch screen information points. Rental of complete solutions and maintenance contracts could also be considered on a short and long term basis. Don't forget many companies are putting screens in busy areas like garden centers and generating an income by selling advertising to businesses. Adding a new digital signage arm to your business is an excellent reason to contact existing customers that may be interested. We all know that it is easiest to supply existing customers, with whom you have an existing relationship. Please email us at resellers@repeatsoftware.com for more information.